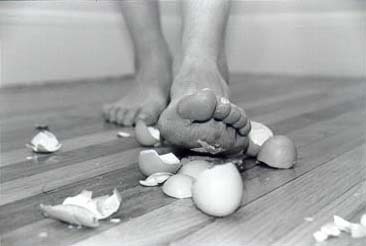 Mrs. S shared Walking on Eggshells, Part 1 with us back on April 20 and is has now found the strength to share Part 2. After today, stay tuned for the next four Mondays as we release Parts 3-6 with you all. Thank you Mrs. S for opening up to all of us and allowing us to walk through some of what you and your family have been through. Who was this man who came home from the war? The man that seemed so cold and so distant? Were we even compatible anymore? I felt that there was something more than just stress going on with him; somethings that he just couldn't tell me what it was…so I did a little investigating. I thought I could talk with his army friends like I used to before the war to find out what was going on with my husband. We lived on the other side of the country from them now but we have all remained close. They all seemed different now too though. They all seemed monotone and secretive. After some more investigating, I finally found out that he was having an affair during his three month re-integration period back from Iraq before moving home. He did ask for a divorce during that time since I told him the kids and I wouldn't report with him to another permanent duty station if he re-enlisted to go into special-forces because that would definitely mean more deployments which I couldn't bare. I was still crushed to find out about the affair. I figured this had to be the reason for how different he was. I confronted him and told him how devastated I was and how I couldn't understand why he would do this to me and our family. He said I would never understand, which at that point I told him I did. I told him that I too had an extra marital encounter shortly after he told me he wanted a divorced. He lost it at this point. He grabbed me by the neck and slammed me into the wall, then punched a hole into our bedroom door. I was frightened but as crazy as it sounds, I almost felt as if, in a way I deserved it. He was screaming profanities in my face and telling me how he couldn't believe he gave up his career in Special Forces to come home to a whore. I pleaded with him to understand that it was stupid and how sorry I was and how it only made me realize that he was the only man for me. When the both of us calmed down we decided that we needed marriage counseling if we were going to get through this and I made sure he knew that if he was every physically violent with me again it would be over. We started counseling at the local VA and he also started attending groups. Things seemed to settle down and we were moving forward. He decided that he should join the Army Reserves to become a Drill Sergeant. I figured this was a good idea and could give him back the military life he was used too one weekend a month and we could still have him at home and be a real family the rest of the time. We both soon realized that the reserves would still have him leave for training, possibly station him unaccompanied for up to a year and could still deploy him. I had to put my foot down. I had just got my husband back. Our daughter was only 8-years-old and our son was almost 4 and he had already missed out on most of their lives. We were also expecting our third child and there was no way I wanted to raise another child without him. I begged him not to pursue the reserves and he complied but seemed to resent it. 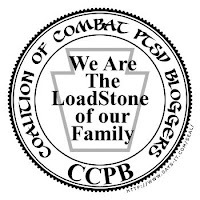 Through groups and counseling we realized that he may be dealing with much more from the war than either of us had suspected. He did say that he was told by a VA doctor, upon returning from Iraq, that he had symptoms of mild PTSD. His OIF/OEF coordinator strongly suggested he file for VA compensation. It was somewhat of a long process with many appointments but he was eventually diagnosed with PTSD and started to receive his VA disability a few months after. He started occupational therapy, physical therapy, and speech therapy…all were out of town about 60 miles away though. The driving was really hurting his knees so he stopped going as much. He had x-rays done of his knees which showed tiny stress sprains behind his knee caps probably from the excessive impact on them during his 15-month deployment from Iraq. He was told he needed to do moderate exercise to strengthen them. He was prescribed braces for extra support in times of need but didn't wear them much. My husband felt he needed new direction in his life so I encouraged him to enroll in community college which he did. He started taking a full load…Math, English and Psychology. During the third week of school his psychology class was going to have a live brain on display…he realized that being exposed to body parts again could possibly stir up stress that he wanted to avoid so he dropped the course. He started having trouble in math class too. He’d always been good at math but was really struggling this time around. He couldn't seem to remember anything and it really aggravated him. He decided that he no longer wanted to take general education classes at all, besides we were about to have our third child and he wanted to be invested in helping raise this one. He decided he’d re-enroll in school in the fall. We had our third child, another boy, that spring and I felt that our family was complete. I was so happy to see him start to bond with our baby, as well as our other children. We seemed to be a ‘normal’ family. We started riding quads together and getting our kids into sports. We had a nice home a steady income now since he was now also declared ‘unemployable’ by the VA and was being compensated for it as well. He began school again that fall. We found out that he qualified for the post 9-11 GI bill and were anxiously awaiting the extra income. We even financed a bigger vehicle for our growing family. When the money didn't come though we started to stress but he found out that there was a way to get ‘fronted’ the money through the GI bill so we did and felt secure again. He bought a fixer upper car that he planned on flipping to sell for extra income.